For a higher learning institution, the decision to venture into online program development immediately generates a torrent of questions, the answers to which are key to project success. One of the most important – and most complex – is with whom to partner and how the financial side of the partnership will work. 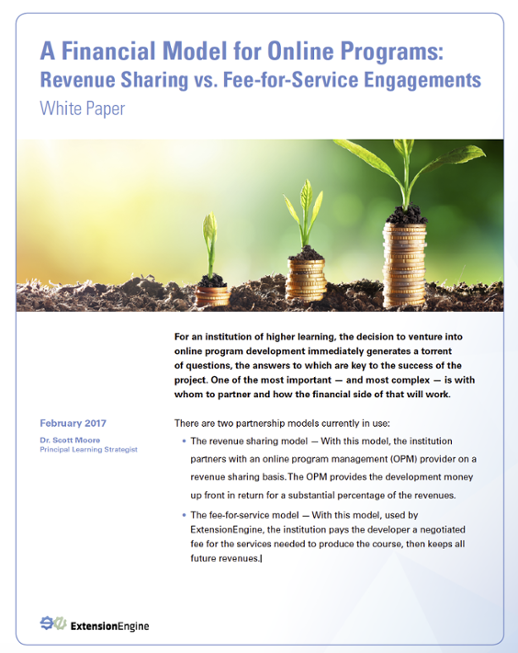 There are two partnership models currently in use, the revenue sharing model and the fee-for-service model. Colleges and universities looking to offer unique and engaging learning experiences. Dr. Scott Moore, Principal Learning Strategist at ExtensionEngine, and Howard Lurie, Principal Analyst at NRCCUA have an unscripted discussion about online learning. Do you feel your online learning program may not be living up to it’s potential? Download this white paper to learn how to adapt it to take advantage of evolving technologies. Are Microdegrees a Sustainable Business Model? We create online learning experiences. ExtensionEngine is a services firm that helps training companies, corporations, nonprofits, and universities create online learning to generate revenue or impact. We guide clients from vision to success through online learning strategy, learning platform development, course development, instructional design, creative, and marketing. Leveraging the latest advances in learning science and technology, we take a comprehensive approach to develop online learning experiences that engage learners, encourage collaboration, and increase revenues. We work with those who think big, innovate and want distinctive learner-centric online experiences.